Getting people to attend the conference you are organising is obviously important, particularly if the conference is a public one where the more people you invite the more you will cover your costs or even make a profit. If you are running a non-public conference then the acceptances are perhaps more important, making sure you know who is coming, who isn’t, and putting any special requirements in place when it comes to running the conference. Invitations to delegates to attend a public conference need to be personal and relevant so use any databases of previous attendees, members of relevant trade associations or academic bodies that you can get hold of. With a private conference you will presumably have access to that information from the holders of the conference. Some conference organisers have a process of ringing each company they send invites to. They check that all the relevant details are correct and up-to-date, so that they can target people accurately. Sadly this is usually shown to have little business benefit and isn’t cost effective. 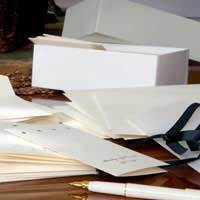 The savings from preventing invites going astray is a minimal proportion of the costs of sending out a large mailing. Sending out the invitations is usually done by post but increasingly email invitations are seen as being more acceptable. This is particularly the case at the moment with the increasing focus on global warming as email is seen as greener than moving all that paper around the globe. If you are organising a conference that has run for some time and has a good reputation, perhaps the best way to approach this is to ask people to tick a box on their acceptance to say that they are happy to receive an email invitation next year. Then you can slowly migrate to email conference invitations which are, let's face it, a lot cheaper too. Make sure that you co-ordinate email and postal monitoring to make sure that people's responses don’t get missed. The invitations, whether postal or email, should include a reply portion with the various options to be selected. You may have a menu of options for people to attend different sections of the conference at different prices, or accommodation bundled in that people may want to accept. Other options are dietary preferences and any access issues that people may have because of disability. A minor but important one is about marketing preferences. You need to ask people if they are happy to receive further communications from you and also from anyone else you pass their information on to. If you don’t ever intend passing their details on to anyone else then make sure you make that clear too. You should also include somewhere for people to indicate that they no longer want to receive conference invitations as well. On receiving acceptances you need to make sure that you correctly record the information on them and store those details so that you can use them properly when the conference begins. If you want your conference to appear business-like it's important to make sure that people who have accepted do not receive reminders or repeat invites. It's more likely that you will not get answers rather than outright rejections. But if you do receive rejections it's worthwhile phoning or emailing to ask if someone else in the company might be more relevant to invite to the conference. Before you make that call though, make sure you have checked to see who else in that business has received an invite, or even accepted, so that you will appear on the ball when they start firing names at you.